The USC Korean Studies Institute is pleased to announce the seventh annual graduate student symposium. 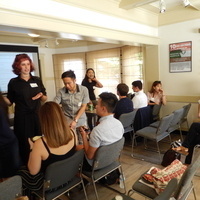 This symposium aims to professionalize graduate students, nurture their scholarship, and create interdisciplinary networks of Ph.D. students working on research related to Korea, East Asia, and/or Asian diasporas. The symposium provides students from USC and various institutions with the chance to meet and share research in progress with their peers and participating faculty. This symposium is open only to graduate students. Students from other universities are welcome to join. All participants may access papers ahead of time. Papers will get submitted a few weeks in advance for those who RSVP online. This conference is supported by the Core University Program for Korean Studies through the Ministry of Education of the Republic of Korea and Korean Studies Promotion Service of the Academy of Korean Studies (AKS-2014-OLU-2250003). Please contact Sarah Shear if you have any questions. Open to graduate students from USC and outside universities.